Guatemala is one of the lesser visited Central American countries, but tourism is now a growing industry. Although it is the most populated country in Central America, it is still one of the most economically challenged. Unlike it’s neighbors to the north and east, Mexico and Belize, tourism has not been a major income source for Guatemala until recent years. Nowadays though, Guatemala is becoming increasing popular for backpackers on a budget and even for families traveling to Guatemala with kids. Until the mid-2000s, the country had a bad reputation for violent crime, femicide (the killing of women because of gender), and illegal drug trading. It spent decades in a bloody civil war that finally ended in 1996. The country’s problems didn’t end there though. Many more years were spent recovering, rebuilding the economy and fighting to reduce crime. Although the country has made huge strides and is now fairly safe for tourists, many still associate the country with its violent past. If you are considering a visit to the country, there are many ways to do so. Along the Pacific coast, there are popular ports for several different cruise lines. The historic city of Antigua is perhaps the most popular tourist destination. Nearby, you’ll find the Pacaya Volcano, an active volcano you can actually hike, and Lake Atitlán, a beautiful lake inside a volcanic crater. 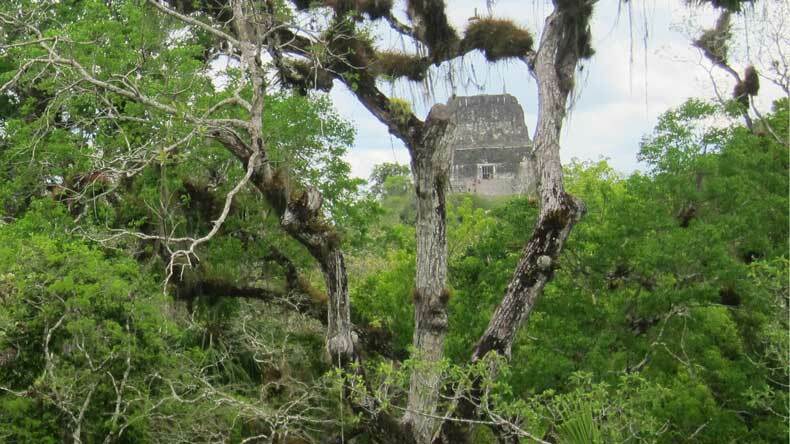 However, eastern Guatemala is becoming more popular among visitors thanks in part to significant archeological sites like the Mayan city of Tikal and the backpacker town of Flores. The eastern region of Guatemala is easily accessible through Belize, but buses and shuttles also run to this area of the country from the other regions, as well. Although some of the cultural differences in Guatemala definitely stood out to us, we found the country safe and welcoming and the people friendly. In fact, our tiny, blonde toddler instantly achieved celebrity status with the Guatemalan natives. 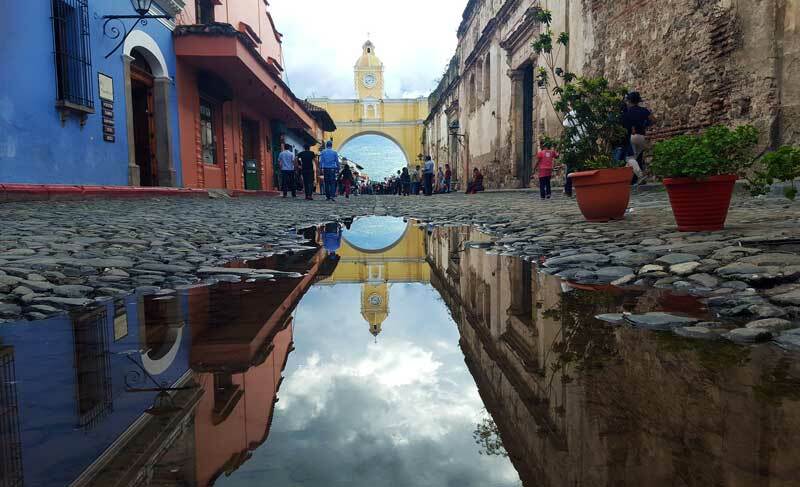 We visited Guatemala in September, which is actually the country’s off-season or rainy season. We lucked out, and had perfect weather during our travels to Guatemala. However, it poured buckets a few days later when we were back in Belize. Their dry season runs from December-April, but you’ll likely pay more for your airfare and lodging during this period, as it is their high season for tourism. Regardless of the season, plan to spend at least one week in Guatemala. Check out this 12-day Guatemala itinerary to help you plan your trip. Visiting Guatemala with kids is a great experience for both parents and little ones. Regardless of their age, taking your kids to Guatemala exposes them to a different culture, a different way of life, and if you speak English, a different language. It is a learning experience and an eye-opening one. 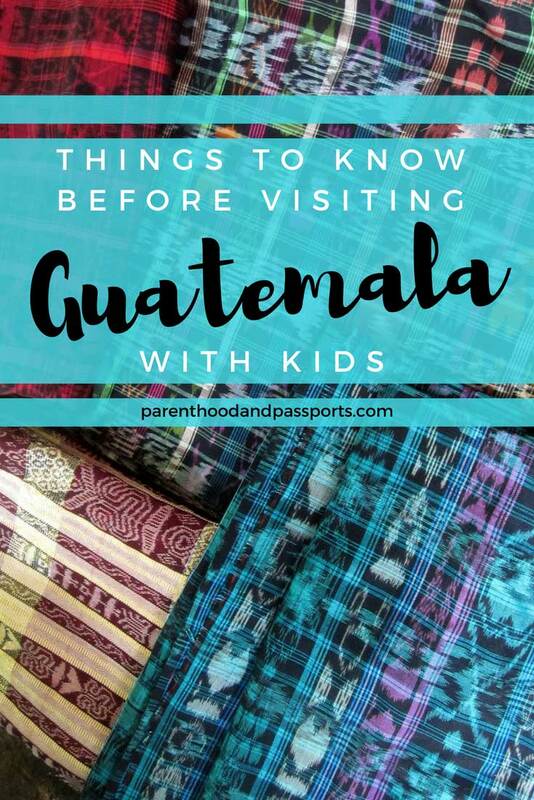 But there are definitely a few things to consider if you are planning a trip to Guatemala with kids. As with other developing nations, the water is not drinkable in Guatemala. Bring bottled watered with you when you leave the hotel, or buy it while you are out. Also, stick to fruits with a peel (bananas, pineapple, etc. ), and avoid anything raw that had to first be washed, as it was likely washed in the non-drinkable water. Guatemala has a tropical climate. It is hot and humid, and the sun is intense. Sunscreen is a must as is insect repellent. Although we did not personally encounter any safety issues while we were in Guatemala, as with anywhere else in world, be vigilant of your surroundings and watch your children closely. You will likely hear plenty of people tell you about the dangers of visiting Guatemala before your trip. I’ve found most of those comments come from people who have never actually been to the country. Although safety in Guatemala might be a concern in some areas – particularly in Guatemala City – we found the country safe and the people welcoming. 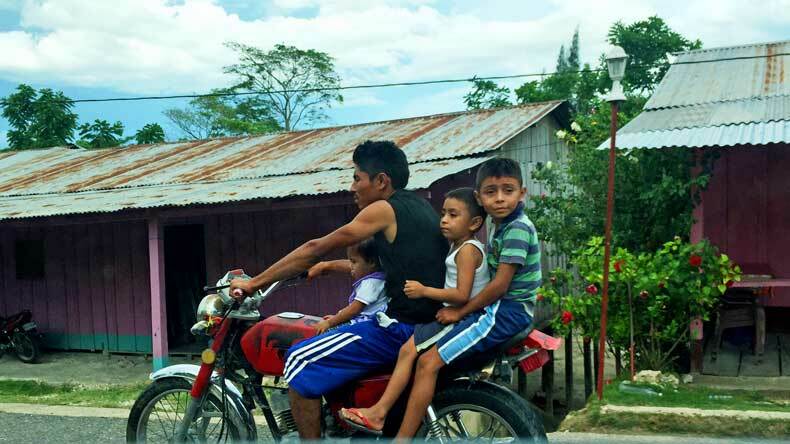 Car seat laws do not exist in Guatemala. Don’t be surprised when you see children as young as one year old on motorcycles with their parents. Car seats are among various safety measures for kids you may not find in Guatemala or other developing countries. Guatemala also does not recognize car insurance, so if you get in an accident, the damages will be out of pocket expenses. When we visited Guatemala, our daughter was up-to-date on all of her routine vaccinations. The typhoid vaccination is often recommended by doctors. We did not get this vaccination, but I would advise checking with your family doctor, and following their recommendations. At times it felt like there were as many stray dogs in Guatemala as there were people. Our daughter has grown up with dogs and believes they are all friendly and want to be pet. While most of the stray dogs in Guatemala are used to people, and are likely friendly, unfortunately they probably have fleas, as well. Take extra precautions so your children don’t approach stray dogs like they would your family pet. Spanish is the native language in Guatemala. You will also find native Mayans speaking their own language. Unlike many European countries, and even some other Central American countries, you can’t really get by strictly on English alone. English is not widely known or spoken in Guatemala. I recommend learning a few key languages or phrases in the native language of any country you visit. The Guatemalan quetzal is the country’s currency. You’ll find currency exchange vendors on either side of the Belize-Guatemala border. There are also ATMs located in the main tourist destinations, and many of the places in cities like Antigua accept credit cards, although there may be a minimum charge. Guatemalans are beautiful people! They typically have darker skin and brown or black hair. So our white toddler with her blonde locks stood out a bit. And locals went crazy over her. 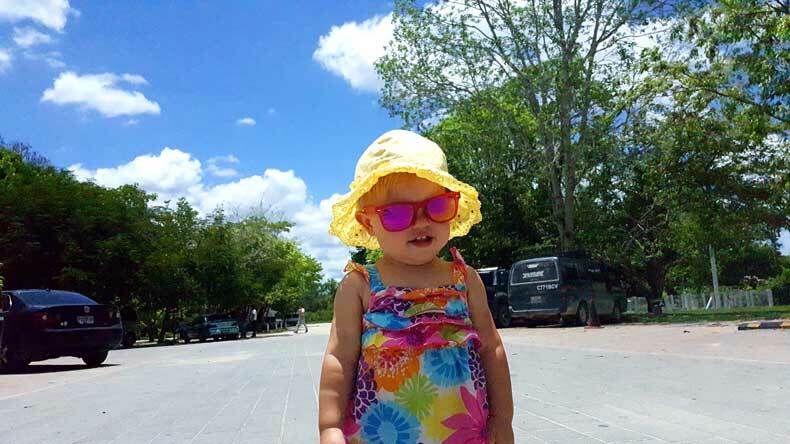 If traveling to Guatemala with kids who have a Caucasian or Asian appearance, be prepared for them to be noticed, and for locals to ask for a photograph with them. 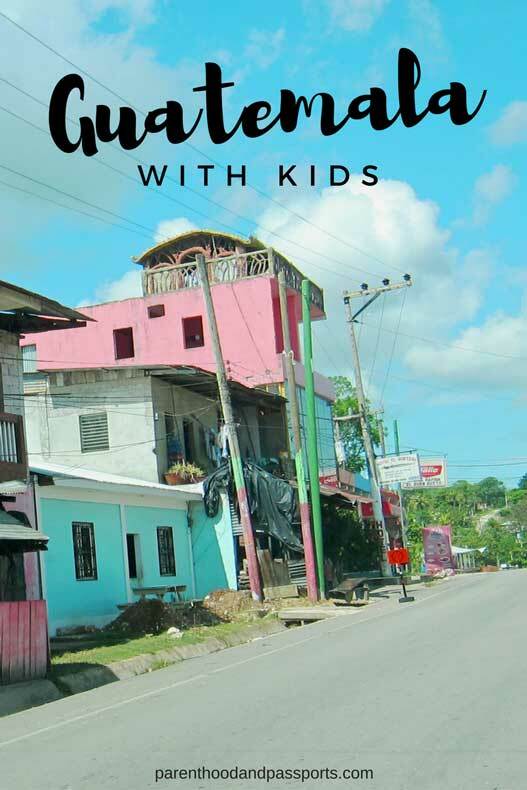 Ultimately, if you are considering a trip to Guatemala with kids, understand it is still a developing country and with that comes certain challenges. But there is so much beauty, history, and culture inside this country’s borders just begging to be explored. And visiting Guatemala and other Central American countries will open your mind and your heart, and it may just change your perspective on a few things, too. 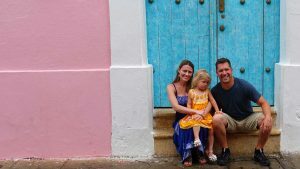 Have a comment or question about traveling to Guatemala with kids? We’d love to hear from you. Leave your thoughts in the comments below. We just got back from our Belize family vacation, with a visit over the border to Tikal. This blog/video was a HUGE help!! (We even took the secret way to avoid the toll bridge) TY!!! So glad it was helpful! I hope you had a great trip to Belize and Guatemala! What an adventure with kids! Great tips for travelling with little ones, very inspiring.